For this purpose the captcha was invented. Besides the fact that captcha sounds nice enough to be a buzz word it actually is short for Completely Automated Public Turing test to tell Computers and Humans Apart, although this is a bit contrived. This means that a captcha is a challenge response mechanism but it doesn’t need to be in the form of an image depicting distorted text which has to be copied in a text box which is the most common form of captchas. Creative new captchas can be found, like a transistor image which has to be read. The first one remarks a captcha as temporal. This means that with increasing processing power and increasing insight in artificial intelligence challenges we now consider to be captchas might not be in the (near) future. Philosophically, this means that captchas are a temporary phenomenon because mankind will eventually be able to build robots which are at least as intelligent as humans are. But for now they’ll do. The second one emphasises the differences we see between humans and robots. This is actually quite an interesting point because mankind actually admits its current limitations in its own intelligence being unable to write software which is able to solve ‘puzzles’ which are easy to solve for humans. Which bridges to the last bullet on the list. Of course you could just add a simple checkbox labeled “Do not check this box if you are human”. No attacker would think of a spam protection this weak but because of that it might just work. The robot stumbling across your comment submission form does not expect such a protection and therefor cannot bypass it. Although this does not qualify as a captcha because the novelty of the protection will only make the attacker look into it to solve it in an instance. Of course a captcha can be a captcha when it is an innovative challenge but it should not rely on being unknown. 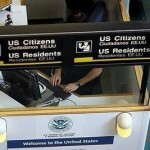 Security through obscurity is not security at all. As time passes by technology advances resulting in more processing power in both processor quantity and quality and more mathematical developments. These are the engine propelling artificial intelligence development. On the other hand, having this field of computer science developing the struggle for making captchas to tell humans and computers apart becomes harder and harder. Who knows when software becomes as advanced as to be able to not only solve puzzles or identify puzzle types but to be really intelligent and thereby be able to find ways to solve a puzzle without knowing the puzzle’s rules in advance? 20 years? 30? 5?! Captcha’s can be useful too. The Recaptcha program for instance helps digitizing books by showing snippets scanned from books which they are unable to parse with their OCR software. This way the snippets are ‘decyphered’ by hundreds of people insuring accuracy and helping the system in which it is implemented to be bot-free. Other examples of captchas might be usefull to the website’s theme such as a math class forum’s captcha challenging users with simple math like or . Another example of such a situated captcha is Adafruit’s. Adafruit is a website and webshop on the Arduino, which is a do it yourself programmable breadboard. You’ll need to ‘read’ the resistor’s value in order to post a comment. 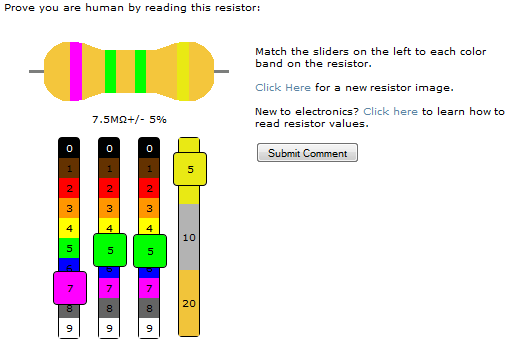 Adafruit's resistor captcha makes you slide the four sliders to match the color code on the resistor above. This entry was posted on Friday, April 23rd, 2010, 19:43 and is filed under Spam protection, Usability. You can follow any responses to this entry through RSS 2.0. You can leave a response, or trackback from your own site.